For most of America, the shooting of yet another unarmed, young black man laid bare the way that racism and inequality play out in our streets. For wingnuts, it was another chance to appeal to the basest of the GOP base. This week, the worst of wingnuttia is all about the killing of yet another unarmed young black man – 18-year-old Michael Brown, who was killed by a white police officer in Ferguson, Mo. O’Reilly wasn’t alone. Fox and Friends host Juliette Huddy mused that Brown’s shooting may have been justified based on a Ferguson police video of Brown allegedly engaged in “strong-arm robbery” at local store. Never mind that the store employees did not call 911 to report a robbery, the store owner disputes the police use of his video, and the rest of the video shows Brown paying for purchases. Fox News Correspondent Steve Harrigan dismissed late-night protests in Ferguson as “child’s play,” only to be told off by a Ferguson resident. But perhaps nothing sums up the problem better than the comments from supporters of Darren Wilson, the police officer who pumped six bullets into Michael Brown. Wilson, whose name was only released days after he killed Michael Brown, has a growing number of supporters and defenders in Ferguson and across the country. Wilson’s supporters have raised over $150,000 – out-raising Brown’s supporters by nearly $20,000. 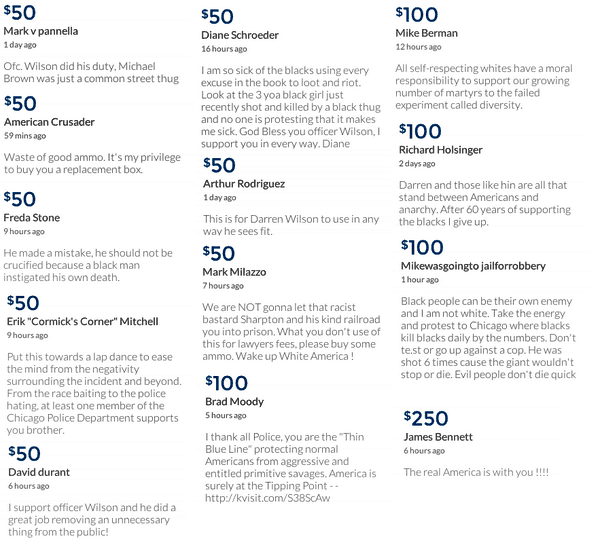 Along with their donations, Wilson’s reporters have included comments that speak for themselves. Mother Jones Magazine captured some of them. No wonder conservatives wish the media would just stop covering Ferguson. The spotlight on Ferguson sheds too much light on worst of wingnuttia.